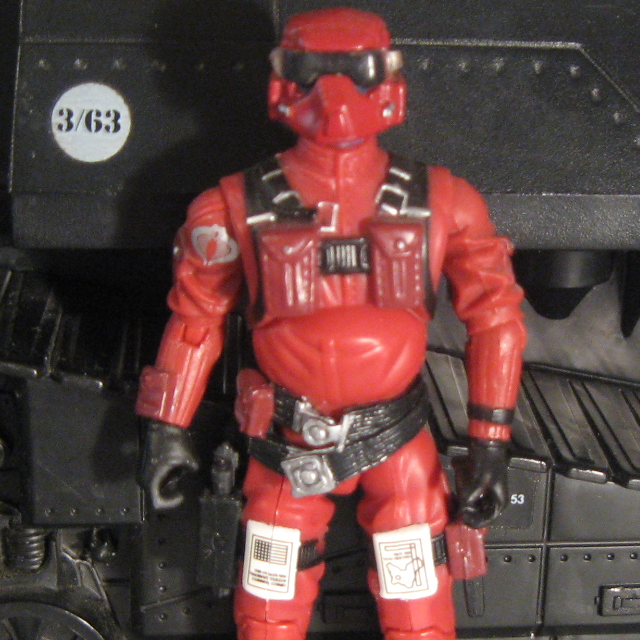 Notes: Sunbow's Wild Weasel wore his 1984 outfit with no Cobra insignia on the right shoulder. The blue under his neck was usually drawn as a cravat worn over the flight jacket. His appearance in Valor vs. Venom is somewhat obscured by his vehicle's canopy and motion blur, but he appears to be based on the first 2004 version. Wild Weasel cut his teeth in the bus [sic, should be "bush"] wars of South America and Africa during the last decade. His knowledge of close support aircraft ranges from jury-rigged civilian conversions to ultra state-of-the-art flying weapons platforms. A mouth injury inflicted during a strafing run is rumored to be the cause of the characteristic sibilance in his speech pattern. Wild Bill says: "He may be a back-shootin', low down snake in the grass, but the boy can fly like nobody's business. You gotta respect the skunk for that! Hey - what did Voltaire say? To forgive our enemies their virtues - that is the greater miracle." Variations: The panel on Wild Weasel's right leg is reversed on some figures. WILD WEASEL learned his trade flying for COBRA operations in every hemisphere in which the evil organization conducts its corrupt business. His knowledge of close support aircraft ranges from jury-rigged civilian conversions to state-of-the-art flying weapons platforms. When the COBRA ground forces are engaged in battle against G.I. JOE troops, WILD WEASEL swoops in to try and take out the enemy's armored vehicles. When he's in the cockpit of the RATTLER, he makes the most of the plane's capabilities for flying low and slow. As wild and unpredictable as his code name, he'll buzz his own guys just to cause them trouble. "There's no place where G.I. JOE can run or hide when I'm flying above them!" Toy Notes: Boxed with a Toys 'R Us-exclusive recolor of the Rattler. Item #53182. The Wild Weasel pictured on the Rattler box has an original torso with a holster and backpack straps in place of the chest panel. WILD WEASEL is proud of his new COBRA RAVEN jet because it's a double threat. It can attack from the air, and in SPY TROOPS mode, converts to a hydrofoil for water missions. "Fighting for COBRA forces to create lots of trouble, on the land and sea or air WILD WEASEL is there!" WILD WEASEL learned his trade flying for COBRA operations in every hemisphere in which the evil organization conducts its corrupt business. His knowledge of close support aircraft ranges from jury-rigged civilian conversions to state-of-the-art flying weapons platforms. When the COBRA ground forces are engaged in battle against G.I. JOE troops, WILD WEASEL swoops in to try and take out the enemy's armored vehicles. When he's in the cockpit of the NIGHT ADDER, he goes looking for trouble just so he can open up the side guns and launch a mouthful of missiles at any G.I. JOE aircraft unlucky enough to fly into his airspace. As wild and unpredictable as his code name, he'll even buzz his own guys just to amuse himself. "There's no place where G.I. JOE can run or hide when I'm in the cockpit!" Accessories: graphite submachine gun (89 Snake Eyes's), graphite rifle (84 Baroness's), dark green backpack (03 Sgt. Airborne's). Much of the COBRA air-to-ground arsenal is state-of-the-art "Fire-and-Forget" weaponry that home in on engine heat or are directed by radar. These can be defeated by exhaust baffles and electronic jamming. The real test of a ground support pilot is whether he can deliver unguided weapons with accuracy. WILD WEASEL has an unerring eye for judging distance and speed, a steady hand on the joystick, and the nerve to keep his sights on the target while being shot at with both ground fire and heat-seeking missiles. WILD WEASEL is a total loner and has no friends even among his fellow COBRA troopers. He always tries to steer conversations around to "trajectory calculations" and "wind deflection," which might be interesting to other people who drop things that go bang from fast moving aircraft, but is yawn-inducing to everybody else. He doesn't realize that people shun him because he's weird. He thinks they are in awe of him. "I love to look through my bomb sights and see G.I. JOE vehicles lined up in row. Even more, I like to see them after I've bombed them into twisted hunks of metal." Toy Notes: Carded in a two-pack with Gung Ho. Item #55995. Toy Notes: Boxed with a recolor of the Night Adder. Item #55497. This vehicle is considered a moderately high-demand and hard-to-find item. Accessories: black pistol (06 Med Alert's), clear goggles with black lens (new), black Cobra figure stand. WILD WEASEL learned his trade flying for COBRA operations in every hemisphere in which the evil organizatoin has conducted its corrupt business. His knowledge of close support aircraft ranges from jerry-rigged civilian conversions to state-of-the-art flying weapons platforms. A mouth injury inflicted during a strafing run is rumored to be the cause of the characteristic sibilance in his speech pattern. As wild and unpredictable as his code name, he'll buzz his own guys just to cause some trouble. WILD BILL says: "He may be a back-shootin', low-down snake in the grass, but the boy can fly like nobody's business. You gotta respect the skunk for that!" Toy Notes: Carded in two-pack with Capt. Ace and a reprint of Marvel #115. Item #29340. Accessories: black pistol (06 Med Alert's), clear goggles with black lens (08 Wild Weasel's). Toy Notes: Boxed with a Target-exclusive update of the Rattler. Item #34115. Distinguished from version 7 by a much lighter blue neck, less silver on the bottom belt, and a black, rather than red, attachment between the cord and the buckle above his chest pockets. Note that this Wild Weasel did not come with a personalized figure stand.